Product Dimensions: 2 inches by 2 inches. Imprint Area: 1.5 inches by 1.5 inches. It is not possible to print a full bleed (edge to edge) on this option. If you're looking for that option, click here for more info. Natural colored latex is included in the price. Red, blue, green, yellow, black or pink colored latex is available for an additional .10¢ per piece. Red, gold, black, blue, magenta, and rainbow foil condoms have a minimum order of 500 pieces and are an additional .10¢ per piece. You will receive a high quality, standard sized latex condom that is made to FDA standards. It is lubricated and has a shelf life of 4 - 5 years. We do not offer extra large or small condoms. If you want to customize a larger size condom, we can use a Magnum or Kyng Condom with our Condom Wallets (the condom foil itself can not be customized, but the outer paper packaging can be). 10 pieces for white foil. 500 pieces for red, black gold, blue, magenta, or rainbow foils. There is no setup charge for this product. After your artwork is approved, it will take 3 - 5 business days for standard production and 1 - 2 business days for rush production before we will ship your order. We will do whatever it takes to meet your event date. Depending on what you're ordering, we'll ship either with FedEx, UPS or USPS. For international shipping quotes, please add your order to the shopping cart. There you will be able to estimate the cost of shipping. Have additional shipping questions? Visit our FAQ Page. We provide samples of all our products for $1.00. Order your samples here. There is an additional 25% charge to expedite your order to be produced within 1 - 2 business days. If you require a faster production time, please call us at 866-997-6542 or email us at support@sayitwithacondom.com. It all depends on the quantity and color of latex you're ordering. You can select the quantity of custom condoms you would like to order by clicking "Order Now" and proceeding to the shopping cart where you can estimate shipping costs. If you're inquiring about ASI, SAGE or PPAI pricing, please email us at support@sayitwithacondom.com and be as detailed as you can about what you're looking for. Are you a school or health care organization looking for non-profit pricing? If so, please email us at support@sayitwithacondom.com and be as detailed as you can be about your campaign. Full color print directly onto the foil of the condom. The back can be transparent so that you can see the condom inside or you can order a white foil back on orders of 1,000 pieces or more. If you want to print on the back of the foil, the minimum order is 10,000 pieces and will take 8 weeks. We do our best to color match your artwork (we ship 10,000's of orders a year and haven't had any complaints). If your order is for 10,000 pieces or more, we can offer PMS matches. Please email us at support@sayitwithacondom.com. 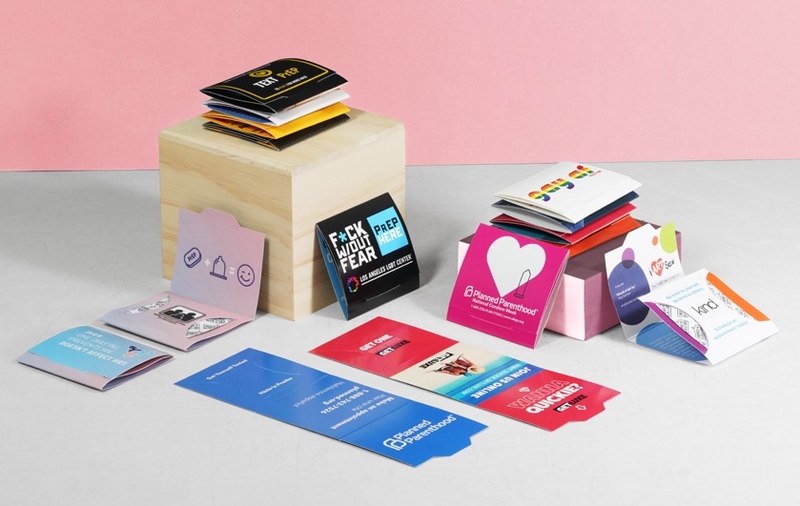 Condoms created in our online design tool do not require a proof. If you would like to receive a proof, please email us at support@sayitwithacondom.com after placing your order. We accept most file types, but for best results, please send us a vector Illustrator file like an .ai, .eps, or .pdf file. If you require a specific font, please include the font file with your order. If you need help selecting a font, please visit dafont.com and choose from their many options. If you require graphic design services for your campaign, we charge $150.00 per hour. If you need assistance with typesetting (choosing the right font or font layout), we will provide you with up to 3 mockups after we've received your paid order. After three mockups have been provided, we will charge a minimum of one hour of graphic design services. Can I see a sample of my design before placing an order? Yes! Just click the "Request A Preview" link above and upload your artwork. You'll receive a digital proof within 24 - 48 hours Monday through Friday. Please correspond directly with your account executive once you receive your preview. Please do not submit multiple preview requests for the same design. We will not create a design from scratch for you. If you need graphic design assistance, we can provide this to you at $95.00 an hour. If you want to design your customized condom yourself and know how to use any of the popular design programs like Adobe Illustrator or Photoshop, please download our design templates and follow the instructions. If you need help creating your design, we're here to help. Just call, chat, or email us.